It’s been said that romance is about fit and timing. So what does a questionable fit and lousy timing get you? That would be Tennessee Williams’s “Summer and Smoke,” a Sierra Classic Theatre/Mammoth Lakes Repertory co-production which opens this weekend at the Edison Theatre in Mammoth Lakes. Like the last production of a Tennessee Williams play (“Cat on a Hot Tin Roof”) which hit the stage in Mammoth a decade ago and starred Rick Phelps as “Big Daddy,” this one similarly features characters with plenty of big daddy issues. The leads are Jason Crockett and Allison McDonell Page, whose families are longtime neighbors. Crockett plays John Buchanan Jr., the son of a well-respected doctor (played by Charles Scatolini). Though he follows in his father’s footsteps and becomes a doctor himself, that’s about the only thing Buchanan Jr. has in common with his father. He chafes against his father’s reputation, his solidity, his rectitude. Buchanan Jr. is a womanizer and a gambler and a boozer and has no intention of changing. Page plays Alma Winemiller, daughter of the local preacher, who’s been in love with Buchanan for, well, forever. Alma’s mother (played by Gail Swain) has suffered from dementia for years, forcing Alma to take on the duties normally reserved for the pastor’s wife. In essence, Alma’s youth has been robbed from her by this familial obligation. And she stews in this adolescent stasis for literally decades. Watching the two … it’s like you get all the loaded miscommunication inherent in a couple that’s known each other for years, without the history, the friendship or the intimacy that you’d think would be necessary for either to bother slogging through such heaviness. I think the Edison will do very well in bar sales for this show. But remember, this is Tennessee Williams, so you’re also treated to his dry wit, clever turns of phrase (“You’re more afraid of your soul than you are of my body.”) and one scene stolen by Shira Dubrovner (Pearl), her hairdo and her failed attempts at reading William Blake. And I really liked Alisa Mokler Harper as the bitchy Mrs. Bassett. By the way, I’m never too much on sets and costumes, but they (being Juliana Olinka Jones – credited with Costumes as well as Directing) and Barbara Taylor (Tailor) did a helluva job with the clothes for this early 20th century period piece. 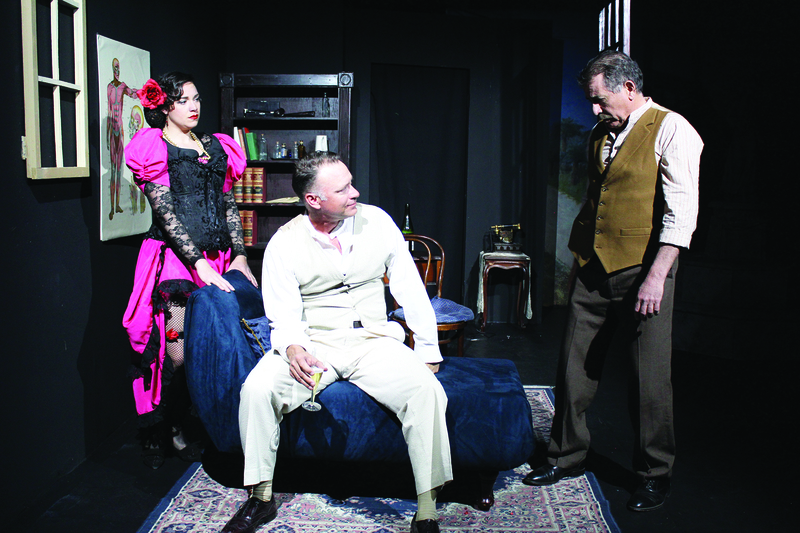 “Summer and Smoke” will run for this weekend and next at the Edison Theatre in Mammoth. For dates and times, see ad page three and sidebar column page 15.